With a growing movement behind the National Student Bill of Rights, youth are taking schooling into their own hands. The week after Obama’s reelection, in lunchrooms, parks, and community centers across the country, people under the age of 24 filled out ballots for or against 15 demands that make up the National Student Bill of Rights for All Youth, or NSBR. The vote, which is still open, is more autonomous than direct democracy, per se — at least for now. Like the Black Panther Party’s 10-Point Program, which inspired the bill, the points of the NSBR serve as vehicles for struggle and inaugurate new subjects into political discourse. What would education policy look like if it weren’t just for students, but by them? 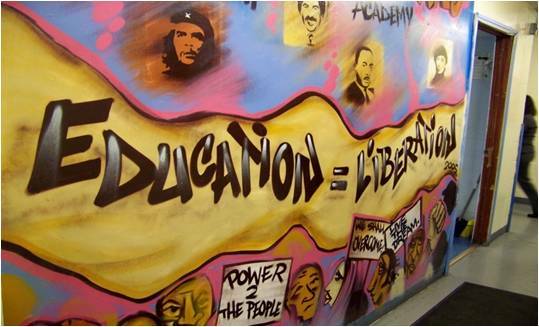 On the morning of July 13, more than 70 people gathered at Chicago’s Uplift Community High School for an assembly at this year’s Free Minds/Free People conference, which birthed the NSBR in 2009. After reflecting on the history and content of the bill, participants strategized tactics for moving it — and the population that it represents — into national consciousness. In its current wording, the bill begins, “The right to a free public education shall not be denied or abridged on account of race, gender, disability, ethnicity, religion, poverty, actual or perceived sexual orientation, gender identity, place of residency or immigration status.” From there, it covers policies that are alien to most schools and diametric to the command-and-control, test-and-slot norms that prevail in the Race to the Top era. It says that students are entitled “to study curriculum that acknowledges and affirms the on-going struggle of oppressed people for equality and justice” and they “shall not be excluded from educational opportunities except for a jury of their peers.” The bulk of the rights harken back to the social-democratic elements of the Panthers’ program: the right to employment; safe and secure schools and housing; free health care, child care, reproductive care and public transportation; full access to recreation, arts and technology. In summer 2010, young people convened at the U.S. Social Forum to share local experiences organizing around youth rights and chart a national plan of action. A year later, at Free Minds/Free People in Providence, organizers brainstormed a list of more than 30 potential “rights,” which they whittled down to 10. Following the initial draft, a core task force, drawn from the Baltimore Algebra Project, Project South and the Alliance for Educational Justice, was formed — anchoring what is now a movement covering some 50 groups in 30 cities and towns. Affiliate groups have held workshops across the country, with some, like Project South, covering vast territory — from North Carolina to Atlanta, New Orleans and San Antonio. Starting with last November’s voting week, the bill took the form of a written ballot. Organizers are aiming to collect 50,000 ballots from at least 25 states. So far, they’re approaching one-fifth of their target. If they reach 100,000, they’ll officially qualify for a “We the People” response from the White House. Their goal is to build the infrastructure necessary for a “one million youth march” on Washington. The gathering in Chicago last month was the latest national strategy session. For most of the three-hour assembly, participants were split into two concurrent sessions — one for young people and another for adult allies. At the adult session, they discussed what resources — legislative and legal training, bail funding, video and audio supplies — they could provide. How could adults, especially teachers, help with recruitment, devise curriculum materials around the NSBR, or train young people on the kinds of participatory action research methods that dictate the evolution of the bill? Outside, the youth contingent blueprinted a series of action plans: setting up local task forces to support citywide and statewide organizing, building a toolbox for spreading the movement, and discussing legislation that the content of the bill could be translated into. Organizers emphasized the necessarily long process of building youth leadership and movement bases in different locales — with some progress, thus far, encoding youth rights in local policy. In June, the California state assembly passed ACR 30, a resolution in support of the California Student and Youth Bill of Rights. In May, the Jackson Student Board of Trustees comprised of student representatives from the district’s seven high schools, approved the Mississippi Student Bill of Rights, which is now up for adoption by the Jackson Public School Board. In December, as Philadelphia’s state-run school district plotted to close more than 20 public schools, the Philadelphia Coalition Advocating for Public Schools released — so far, to deaf ears — a community education plan that includes a 10-point bill of rights. At the end of the assembly, facilitators introduced the idea of a “Youth Political Party,” a vehicle, like the NSBR, for building youth power and elevating the demands of the NSBR itself. On the day George Zimmerman was acquitted for the murder of Trayvon Martin they asked: What would it be like to have a government that cracked down on vigilantism? Or ended deportations? Or stopped closing schools in black and brown neighborhoods? Or listened to young people? “It’s going to take a lot of traveling to different cities, a lot of base-building,” said Saeda Clark-Washington, a 23-year-old from Philadelphia’s Youth United for Change. James Cersonsky is a writer, education activist and editor at Student Nation.